Being Dreamlands itself, and with things like Enchanted Forest being Hastur in all but name, the restriction isn't too bad. Story removal is very powerful as an effect, its hard to imagine many Hastur decks not seriously considering this card. Now we're talking. This basically forces your opponent to commit at least 2 characters to a story if you leave it up for defense. It can also let you shove through some stories uncontested if you're playing offensively. Solid, solid effect. Hastur naturally wants to play Seventy Steps a lot of the time as well, which just so happens to be a Dreamlands card too, basically guaranteeing you to have more than your opponent. I don't really see other Dreamlands cards around, but that might be because of availability. It forces your opponent to commit 2 terror/willpower characters, otherwise you can walk all over them. An auto include in any hastur deck. 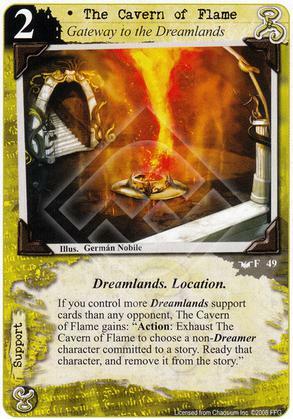 Although dreamlands support cards are available again most are not very good so I'm not too worried about the drawback. In a small meta someone might try and make use of the drawback but if you are going to a tournament don't worry about it. the only time it maybe off is only against another hastur deck. Great card, as long as your opponent doesn't run a lot of dreamlands support cards. Extra fun to combo it with polar mirage. Just realized this card goes great with The Door That Will Not Close. TDTWNC says characters can't "uncommit." Cavern of Flame doesn't uncommit characters from stories, it removes them from stories. Quite a nice little loophole.